Cellular Jail is a popular tourist destination in Andaman Island. Hundreds of freedom fighters were imprisoned and tortured here during the colonial rule. The triple storied Cellular Jail has been built by the British during the colonial rule. It took over twelve years from 1896 to 1908 to construct the building containing 698 cells spread out in seven wings. This symbol of colonial oppression is situated in the north-east corner of Port Blair. It has been turned into a national memorial by the Indian government with names of all the freedom fighters engraved on the walls of its watchtower. Itâ��s a must visit place to feel the colonial cruelty and untold sufferings that our freedom fighters suffered. If you are visiting Port Blair and need a break from town, you can visit Corbyn's Cove which is located 7 km south of the town. This curved beach backed by coconut-palm offers activities such as swimming, surfing, and sun-basking. You can easily find clean and well-maintained bathrooms, changing rooms and even restaurants and bars near the beach. Great accommodation options are also available near the beach. 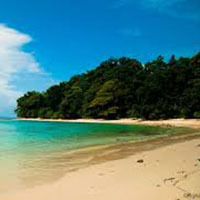 Ross Island is situated 2 km east of Port Blair and is at the distance of short boat ride from Phoenix Bay Jetty. In order to reach Ross Island, boat rides are available from Phoenix Bay Jetty daily except Wednesdays. It was the British administrative headquarters for the Andaman and Nicobar Islands. 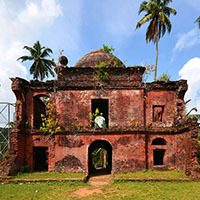 The island was rocked by an earthquake leaving behind the ruins of the Church, Cemetery, Swimming Pool and Chief Commissioner's residence. The place has a good collection of old records at Smritika, a museum managed by Indian Navy. Viper Island is yet another Island popular for the jail constructed by the British where convicts and political prisoners were imprisoned. Viper Island can be reached by harbor cruise from Phoenix Bay Jetty. Its scenic beauty is a real treat to the eyes. However, the place is more famous for the jail which was abandoned after the construction of Cellular Jail in 1906. Remnants of the jail are still there on the island. We offer you to experience the unforgettable underwater life forms. We take you on a one day Coral Island tour where the underwater world comes alive and makes you forget everything else. The corals, fish and vegetation is very vast and engrossing. We take this tour of marine life through a glass-bottomed cruise. In order to reach the island, we make available cruise from Wandoor National Marine Park, Port Blair. The Island is also suitable for swimming and snorkeling. Havelock Island is situated 57 km north-east to Port Blair and usually takes 2-3 hrs to reach there by Government Ferries. The place has ample of accommodations for the tourists managed by the tourism department. Radhanagar beach and Elephant beach are two most popular beaches on the island that one can explore. 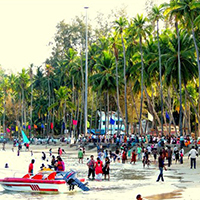 Radhanagar beach was also named as "Best Beach in Asia" by Time in 2004. These beaches are ideal for sun-basking, swimming and snorkeling. It is suggested that the tourists should visit the place for at least one day and explore the Island completely. Andaman is the haven of sea life. 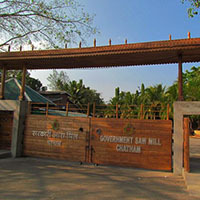 The Fisheries Museum is situated near the Rajiv Gandhi Water Sports Complex. The museum inhibits over 350 species of marine life which are exclusive species of Andaman and Nicobar Islands and are rarely found anywhere else. Apart from live corals and beautiful fishes, the museum also houses a huge variety of sea shells. The place is surrounded by Marina Park and Childrenâ��s Traffic Park â�� two great picnic spots for kids and families. Asiaâ��s largest saw mill was established on the Chatham Island during the colonial rule. The enormous workshops were built using expensive and durable Padauk wood. Most of the wood that comes to the Island is shipped from Malaysia, Myanmar and Thailand for logging has been banned on the Island in 1970. We provide a guide who takes the visitors to the saw mill and familiarizes them with the entire process. One of the most amazing reasons for Chatham Saw Millâ��s popularity is that it has huge saws; saws with over 200-300 teeth which can grind for more than 2-3 hours without a need of sharpening their teeth. 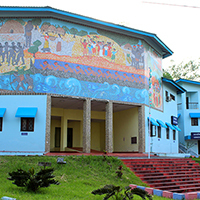 Samudrika Museum is situated in the Port Blair and run by Indian Navy. The five different sections of the museum cover extensive information about islandsâ�� ecosystem, tribal communities, plants, animals and marine life. The Anthropological Museum takes you on a journey back into the fascinating history and colorful culture of the Andaman and Nicobar Island. It was set up in 1975 at Haddo in north Port Blair. Itâ��s a must visit place for those who have some great interest in history and archeology. The museum offers a glimpse of intriguing tribal history. Boats, weapons, baskets, clothing, photographs, models and records of exploratory expeditions which are on the display are of one of the oldest Tribes in the world. It also has a library offering invaluable references of the tribal culture to the scholars. 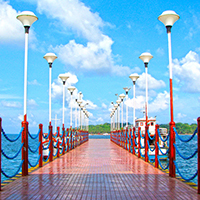 The Mahatma Gandhi Marine National Park at Wandoor was built in 1983 to preserve the tropical eco-system in Port Blair. It encompasses 281 sq. km including 15 uninhabited islands and the surrounding sea. However, only two islands, Jolly Buoy and Red Skin, are open for the visitors alternatively for six months each. It is a lifetime experience to visit the place and look at the rare corals and underwater marine life through glass bottom boats. The place also offers adventure sports such as Scuba Diving and Snorkeling. Marina Park is a newly constructed amusement park. Marina Park is situated near Water Sports Complex right on the seashore. It is a must visit place with kids and family. The park offers rides such as giant wheels, paratrooper and dragon coaster. The park also has an aquarium displaying endemic marine organisms and marine habitats. The adjacent botanical garden gives a glimpse into the lives of different species. A statue of Netaji Subhash Chandra Bose is being also installed here. The entire cluster of Andaman Islands can be viewed from Mount Harriet. With the height of 365 meters, it is the highest point in the South Andaman. During the colonial rule, Mount Harriet was the summer headquarters of Chief Commissioner. 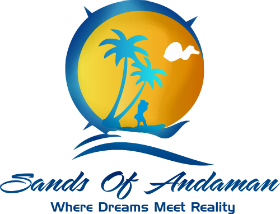 Now, it is one of the best places in Andaman to enjoy trekking and scenic beauty. The place is a home for various species of birds, butterflies and animals. The ferry takes around 15-20 minutes to reach there from Chatham and Phoenix bay jetties whereas; a road trip may take up to one hour. Mount Harriet has some beautiful guest houses to provide accommodation to travelers. 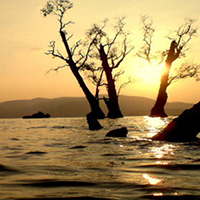 Chidiya Tapu is the best place in Andaman to view the sunset. It is barely 25 km away from Port Blair city. It takes hardly 40 minutes by road to reach this southernmost tip of Andaman. The place is covered with forest and numerous avian species, deer and a few seasonal varieties of orchids can be spotted here. Itâ��s green landscape and enthralling beaches such as Munda Pahar makes it an ideal picnic spot. Chidiya Tapu can be visited at any time of the day, but evening is preferable because of the beautiful sunset.